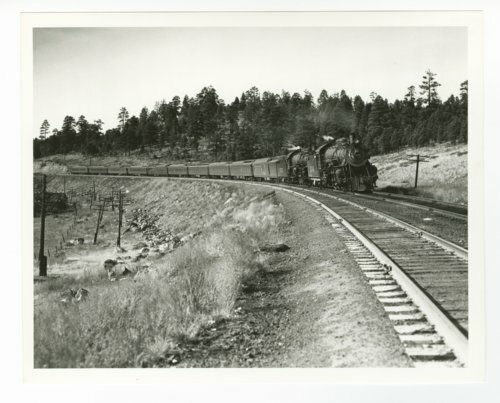 These two photographs show steam locomotives #1346 and #3721 from the Atchison, Topeka & Santa Fe Railway Company, pulling a passenger train near Flagstaff, Arizona. Both locomotives were built by the Baldwin Locomotive Works of Philadelphia, Pennsylvania. The wheel arrangement for locomotive #1346 was 4-6-2 and locomotive #3721 had a wheel arrangement of 4-8-2. Both engines were scrapped for metal in 1955.